On the heels of PopCap’s billion dollar acquisition comes some interesting news from the social games front: Game developer Storm8 is today announcing a few impressive stats. Among other things, the company is claiming that it has become the “largest mobile social games developer in the U.S.”, boasting over 210 million downloads across iOS and Android. While those numbers are certainly impressive, with Angry Birds raking in over 200 million downloads, I think Rovio, Zynga, PopCap, Outfit7 and quite a few others might have a thing or two to say about that, each of which has fairly sizable user bases in the U.S. Then again, Rovio is in fact Helsinki-based and Outfit7 is international as well so Storm8’s claim to American soil likely stands — at least in relation to the Angry Birds and Talking Tom Cat makers, respectively. Co-founded in 2009 by Chak Ming Li, Perry Tam, and William Siu, all former Facebook engineers, Storm8 is most well known for being the creator of addicting role playing games on the iPhone, iPod Touch and Android devices — as well as for being the parent company of top mobile social game developer, TeamLava. According to Tam, who is also Storm8’s CEO, each game released by the Storm8-TeamLava group has reached the Top 10 on the App store free app category. Not too shabby. The team’s suite of games, which includes titles like iMobsters, World War, Vampires Live, Pets Live, Bakery Story, Restaurant Story, and Fashion Story, is currently averaging over 4 million daily active users, Tam tells me. What’s more, earlier this month during a promotional event, Storm8 reached a unique achievement: It had its first “million dollar day”, which of course is another way of saying that the company raked in $1 million in a single day thanks to in-app purchases made utilizing its freemium model. 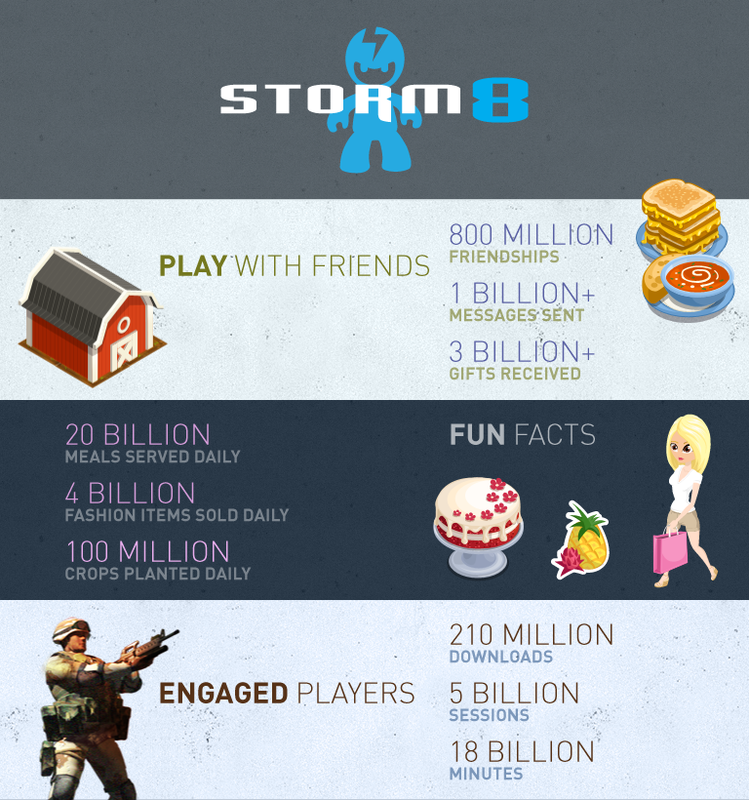 Taking advantage of the skyrocketing popularity of social games on mobile platforms, Storm8 has managed to hit these milestones without taking any outside investment. Tam wasn’t willing to divulge what the company’s revenues look like at this point, but with a million dollar day already in its pocket, it wouldn’t be too much of a stretch to say that Storm8 has cleared profitability and will continue to see escalating revenues as it embarks on its mission to bring its game catalog to an international market. We believe Android’s time in social gaming has arrived and feel our new titles will flourish thanks to innovations we’ve made in gameplay and the overall improvement of Android infrastructure. While 210 million+ downloads across 58 million devices and a user base that has grown 300 percent this year are certainly impressive stats (as are those in the graphic above), I’m still hesitant to give Storm8 the “largest mobile social games maker” crown, but this does seem evidence enough to prove that there is some serious competition for our hearts and minds in social games on our mobile devices. Storm8 will no doubt continue to play a big role in mobile social games in the foreseeable future. So check ’em out.